To achieve the best absorption of ch'i, always sit on the lap of the lone human in a room, or between two humans. If there are more than two humans in the room, sit in the southwest corner and stare at them. When they glance at you, absorb the ch'i. I'm not much of a lap kittie, but I was trying to move in on mum and she had her yarn in her lap while she was trying to cro-say some kittie snuggles. So I guess I was doing OK as far as my fang shui today. Mum and me are glad it is Friday and the weekend promises to be nice and sunny again. So now with the weather getting nice, we may not be around as much on the weekends. So you all take care. This is for Karen Jo to cheer herself up. Poor thing had to have surgery on her foot. Excuse me, mum is interuppting me here. Says I need to make up my own for Karen Jo after her footie surgery. Hmmm, I have never written a limerick before. Better figure out how to do this. I can haiku, so let's search on what to do for this. The site ehow.com gives the following steps for writing a limerick. 2. Create the following stress pattern in lines one, two and five: da-DA da-da-DA da-da-DA da. For example, "There ONCE was a FEL-low named JER-ry...." You can omit the last unstressed syllable if you prefer. 3. Create the following stress pattern in lines three and four: da-DA da-da-DA da. For example, "Per-PLEXED our dear PO-et." As before, you have the option of omitting the last syllable. 4. Make sure your limerick's rhyme scheme is a-a-b-b-a. In other words, the first, second and fifth lines all rhyme with one another; the third and fourth lines rhyme with each other. 5. Exploit puns and wordplay. How hurtie are Karen's toes? Only she will ever knows. Healing purrs we send as a rose. You Expect ME to Think? Forty Paws has nominated me for a thinking blog thingy. I am a cat, I try not to think to much beyond, food, treats, toys, playtime, nap time. But thanks guys. While I try not to think too much here are my choices, I think most of them have not been tagged. The Crew - for just a nice kittie family here in Whiskerconsin. Two boy kitties and two girl kitties with their beans. Mattingly & Harlie - Two growing cats in the big city. Perfectly Parker - Adventures of midwestern kitties and their mum who volunteers working with shelter kitties. Cheysuli - what more can we say of this beautiful meezer who is running for President. Plus a wonderful source of food info. Fat Eric - our floofy furiend who shows us about life in another country, the UK. OK I have been thinking too much now. Time to nap. OK, mum has raided the closet and came up with something to auction off for LillyLu. The actual auction is on the Cat Blogosphere. So bid early, often and high. If you can't knit, mum will knit it for you. The color is a nice soft pink. Perfect for lots of kitties who like pink, Skeezix included. I moved my blog color back to a blue for now. Still thinking pink for LillyLu. She is starting to eat on her own. Plus something important for all kitties and their beans to know. If a kittie isn't eating it is serious as it causes liver issues. I don't know if I am a nar-cis-cist, whatever that means. But I do know I need to wash my face, lick my paw, rub it across my ears, eyes and nose. Rinse and repeat, over and over. About my porch. Mum got it at Target. It is actually a collapsible portable kennel for woofies, so go and look in the woofie section. Its a Boot & Barkley thing. She got it last summer. First some pink flowers for LillyLu. She is home and being fed special food. Continuing lots of purrs for her. And for Earth Day, we have gone green! The one thing with new blogger and this template, you can change your colors quickly. Well it really must be spring. Mum was taking something outside and Vir-ginger managed to slip out the door. Now mum lets her outside, but not me, mainly because she is well behaved and doesn't run off. Unlike me, who the one and only time I got out, headed for the house next door. hehe. But I do get to go outside if I am inside my porch. Since it was such a nice day today mum put me inside my porch and we spent some time outside together. Mum readed her magazine and I chittered away at all the birdies coming to the feeders. Even a squirrel came around the corner took one look at me and went back where he came from. So Vir-ginger has been checking things out while mum has been busy doing little things in the yard, like picking up sticks, cutting the last of the old plants down. Mum even gotted the grass eating monster running. Here Vir-ginger is showing the baby lilacs that are slowing starting to open. Here she is up in the tree. The box has fluffy stuff in it for the birdies so they can have soft stuff for their nests. We had so many birdies singing and coming by the feeders. We even saw Mr Hawk flying up in the sky, looking for some unsuspecting creature to capture for his lunch. The aloe vera plant that mum thinks was making me sick has ended up on the patio for now. Vir-ginger is sitting next to it, not eating or jumping on it. I think Vir-ginger a a little Miss Goody Four Paws, she never seems to do anything wrong! Me on the other hand, well, lets just say I occasionally get my tail in hot water. Mum cooked outside, making a nice chicken breast for herself and yes she shared some of it with me. It was furry good. Sitting on the edge of the bathtub while it's filling can help you absorb water energy which aids tranquility. Use caution - falling in creates a highly negative kind of ch'i. Mum doesn't really fill up the tub hockey rink, she uses the hot rain attachment to stand under. Plus she closes the door while the rain is coming down. But as soon as she is finished, I get my little paw inside the door and start to push it open. Then I check out the water on mum's leg, licking it off. Then mum leaves me alone to drink more of the water. About mum's leg the other night. I am just playing pounce and I just get carried away sometimes. I am just be me, Mr Derby Sassycat. Nothing is wrong with my diet or love life or anything else. I am just a young and energetic mancat who needs to play and play hard. Sometimes I get mum a little too hard, but yes she still loves me. But I did make it up to her. As she got dressed yesterday morning I jumped on the bed and rubbed my nice soft fur against the bare skin of her back. I purred and I got lots of extra hugs and scrithces. So all is well in my life. Still pink for Lilly Lu. Updates at MuShue's blog. But I decided to go even pinker, we mancats can do pink too you know. 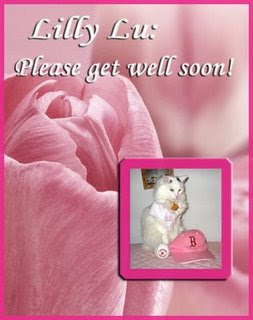 One of our furiends, Lilly Lu is ailing updates at MuShue's blog. Thanks to Daisy for making the card. The Pink Ladies rock. Healing purrs being sent out. I've gone pink in support of Lilly Lu. For my mummy tells me so. I jump and pounce, and use my teeth. Causing damage, so to speak. My mummy tells me so. I love to stalk and pounce on mum. Normally that isn't a big issue. But last night as mum got ready to go to bed I got into pouncing mode. Even though mum saw me and tried to keep away from me, I jumped and got her leg. You can see the damage, not much, but mum says I got a little carried away. At least this guys recognizes our intelligence. What would be better is if we could get eight doggies to pull a sled in the snow that is full of kitties! Now that would be good. We could all snuggle in the sled together and watch the snow fly by! The picture of the day is currently mum's desktop on the 'puter. She selected an image and it sized it so just my face shows up! Look at those thoughtful and caring eyes. Plus you can clear see my two-toned nose! But I look so serious here, must have been getting ready to put the bitely on mum, enough with the photo ops! Lots of headbumps and purrs to Diva Kitty, the fluffies and DKM on the loss of Joaquin: plus MC, Missy and ML on losing Bear. Our thoughts are with you. Plus a big HAPPY BIRTHDAY to two of mum's friends - Barb and Jane. I have met them both and they are furry nice and have had kitties of their own. Bandit and Magic. The weather is back to where it should be. The sun is out, the weather is warmer and the windows are back open. Mum spent part of yesterday tuning up the grill, it needed a new gas thingy as the old one had rusted and had a big hole in it. So it was using way more gas and not cooking evenly. She also brought in the thing that the food sits on to clean it. I managed to get a bit too close and got some of the icky stuff on me! See that dark smudge on my nice white fur. That meant a along and serious cleaning session with my tongue, but I think I got it all off now. But mum decided the easiest way to get the grill grate clean was to put it inside the hot as hell box and turn on the cleaning cycle. So today she was taking everything out and wiping it out. I decided I had to snoopervise that she got everything wiped out properly. I approve, it is OK for you to use the hot as hell box again. P.S. Mum was not happy that I jumped in here and after the photo session, I was promptly picked up and dumped out! While mum was working outside, she needed to sweep off the patio area. Get rid of some of the grill crud that she knocked off of the thing, plus some of the seeds and stuff falling off the trees and birdie feeders. But when she moved something to sweep she found a surprise! Mum thinks it is a leg from a bunny! Most likely that Mr Hawk was around and caught him. Then either the hawk or some other wild animal dragged the leg near the house. This is right by the big windows that go to the floor, but I don't remember seeing anything. So this must have happened while I napped. Mum didn't want to touch it, but also didn't want to have it sit up by the house. So she used one of her tools that she was using on the trill to pick it up and move it. And lots of our flowers are coming back, even with the snow and cold weather. The poppies, daylillies, peonies and lots of other stuff are starting to peak through the ground and get green. Soon we will have lots of flowers. I know some of our blogging buddies are getting nasty weather, storms, rain and snow. Hope that you all are safe and dry. Yipee our beans made it to the weekend. Mum has been busy shopping, several trips worth, first the food, then another trip for stuff in fancy bottles. Those are bottles she opens when she wants an adult beverage, something about being 'Vintage'. But the good thing about her leaving is that everytime she comes home I get my coming home scritches. Our snow is fast disappearing and I am happy about that. Mum opened a window for a bit yesterday when she got home. It was nice and sunny and getting warmer again. If we gets more sun our snow should be gone by Monday maybe even tomorrow. Below are some pictures of what the place looked like Friday when mum came home from work. And mum was looking through pictures last night and found one of me checking out the aloe vera plant some months ago. As you can see I was stretching out as far as I could to get at it. But couldn't get to it. Mum looked at the date of the picture and it was last fall, so most likely this was taken after she moved the plant back into the house. The only way for me to get the plant was to jump into it from the floor. If I would have jumped from anywhere else I think I would have crashed it into mum's cabinet where she keeps her fancy stuff. So stuff might have gotten broken. So I just launched myself from the floor to on top of the plant. So if you have green plants in the house, mum says to make sure they are kittie safe. But since it seemed like I wanted to get some green stuff, mum quick went and bought me some kittie grass to chomp on. Maybe my jumping in the plant was my way of telling her I want some green stuff to chew on! To creat good ch'i, a living wild creature should be brought inside the house to be played with. If it dies during play, walk away from it. Dead things have negative engery - except when given as gifts to your owner. See the mousey? I am checking it out after mum smacked it with her shoe last summer. I didn't bring it in the house, it came in all by itself. He didn't figure on meeting up with me or Mum. Here mum moved it over so the grey mousey is on a lighter covered paper thing so you could see it better. But I found a mousie the other day and left it on the floor by her 'puter bag. I wanted to make sure she didn't miss it. She found it just fine, then she moved it outside again. You can click on the pictures to biggify them. It may show April on the calendar and spring by the position of the sun in the sky. But this is what we got falling from the sky today! Our poor little flowers are buried under the snow. But there have been lots of birdies around today eating from the feeders. With the ground covered up the poor little guys gotta find something to eat. So it is good that mum keeps the feeders full all the time. I so much want warm and sunny weather to come back. Have the windows open, smell the air outside, hear the birdies singing. Come back spring. Please? Lots more questions again lately, so here it goes! 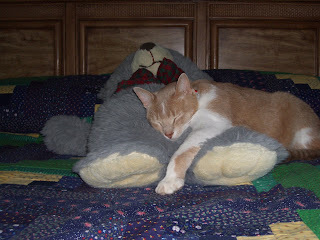 Yes Max, I do nap with the teddy bear. Mum has lots of teddy bears but this is the only one I sleep with. It is on mum's bed so she sleeps with it too. So at night sometimes, she is in the the bed, I jump up next to her, snuggle with the bear, make biscuits and PURRRRRRR. Mr. Hendrix thought the bear was trying to smother me. No bear and I get along just fine. Skittles was talking about a more natural diet. Mum is thinking that way too. But being an inside cat I can't get at fevvers and stuff. Plus, I am claw-less, so not sure how much stuff I would be able to catch. I might starve! Plus Skittles has a new admirer, SlyCat. Parker asked if I found sheet mice when I was the bed lump under the sheet. I don't know what a sheet mouse is! Parker, can you tell me what you are talking about? About the hanging toy, did I get it? NO. After mum took a few pictures, she moved the box so I couldn't get up that high. Sheesh, she is no fun sometimes. One-eyed Jack asked about my glitter balls and if they are like tinsel. Well, the glitter is so much finer than tinsel. But my glitter balls have stayed together. So don't know if other kitties have had similar experience of them "shedding". The new layout on the header, mum worked furry hard to get it just right. But that is with the home 'puter. She got a new 'puter at work and she can see 6 and 1/4 of me on the header. Anyway I look good! Mum says my digestive output has look very nice for nearly a week now. The one thing she thinks I might have been doing? Getting into one of her plants. When I jumped into the big pot with the snake plant she moved that outside. But she had an aloe vera on top of a very tall stool. You guessed it. One morning she caught me jumping into the plant. Mum immediately picked me out of the plant and moved the plant into the little bathroom and shut the door. Then after that I started getting better. I will never tell if I was chomping on that plant! She is furry happy and says I am acting like my old normal, sassy self. She likes that. Note from mum: For Derby to jump into the aloe vera, it is a four foot jump from floor to the top of the flower pot. There is no room for him to land on the stool so he has to get into the plant itself. And if he missed, the whole thing would probably have tipped over. Even if he stretched out on his back legs he couldn't get at the plant at all. He hasn't messed with this plant, or any of the others, in the nearly two years he has lived here. I had given away other plants that I knew would not be good to have around the house. The aloe spends the nice weather outside, so now, it is confined to the garage and most likely will just get tossed. I figure once the plant had attracted Derby, he will be back at it if it comes into the house again. I figure he wqs either be just getting a small amount of plant or plant fluids to upset his digestive system, but not enough to really get to the toxic level. Maybe enough on his paws which he probably licked off. I finally put one and one and one, together over the weekend. My brain must have relaxed enough to connect what happened. So he is back to eating the rest of his normal stuff and doing just fine. Thank goodness, I was getting worried that this was going to be a chronic condition to manage. At just over three years old, he should have a long life ahead of him. Thanks to all for your support and get well wishes. "You can't look at a sleeping cat and be tense." Jane Pauley. That is why we kitties are such good medicine. We help people relax, which helps their blood pressure and other such things. Kitties are good for you. Go and bring one home. Hope everyone had a good weekend. While it was cold here Easter still came. Mum even cooked outside last night. She was bundled up with her mittens and earmuffs on. But the first bratwurst of the season has been grilled and eaten. It might be spring and Easter but it is COLD. Freezing cold, the heaty thing is putting out warm stuff, but when mum opens the outside doors you can really feel it. No windows have been open here for nearly a week and I would like some fresh air. Mum took a picture of the temperature thingy this morning, see 19.6 degrees Fahrenheit. That is not normal for this time of the year. When we got up there was some of that white stuff back. Just a little, but it is still snow. It is still coming down and blowing around. Not much, but you would think we were in winter not spring. The cold weather has not been good for our little flowers outside. Look at what the daffodils and such all look like. Mum says most of the tulips haven't started to come up yet, so they should be safe. Hope the rest of you are keeping warm. I know it is furry cold all over the place. Don't worry about finding the Easter eggs, find the Easter bunny and snuggle with him or her to keep warm. Good grooming makes for good feng shui. Clean often, paying special attention to the delicate areas of the hindquarters. This must be done in the northeast corner of the room in full view of everyone, especially guests. When the wise cat is satisfied with the cleanliness of its hindquarters, it should present them for inspection. Get as closed as possible to the selected guest, and then swing around so that he can admire your clean hind parts. I can do that! Me showing off how well I can reach around to keep myself nice and clean. Plus it is soooo much fun to do this in front of people who don't have kitties. Plus mum was especially please with my digestive output the past two days. She says things are getting back to normal. That pleases her very much. Me too, that means I won't get taken back to the vet.